NMEA 2000 is not a simple modernization of 0183: it greatly simplifies the installation of equipment on board, while providing a wealth of very superior features. In recent years, electronic equipment for pleasure boats have used a standard of communication called NMEA to exchange information. 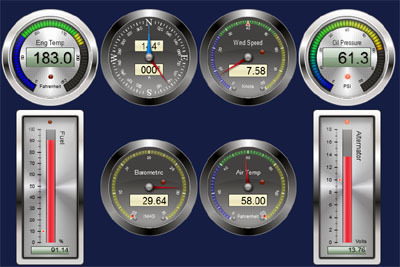 The first version of this standard, called NMEA 0183, was defined to handle the main instruments useful to navigation (sounder, wind vane, anemometer, loch, GPS etc...). Based on now outdated network technologies - including a very low speed-, this standard cannot cope with all the new equipments. To circumvent the limits of this first standard, a new version was defined: NMEA 2000, which has two decisive advantages: 50 times higher throughput, and a native "autoconfigure" capability, meaning that all devices are capable of dialogue between them without the need of a particular organization. The wiring is also considerably simplified, all devices can be connected either in series or in clusters, with standardized connectors. With NMEA 2000, it is thus possible to connect new equipment at any point in the network of the boat. Every information is 'signed' by equipment that supplies it and will be detected by other devices that need it. Other equipment will just ignore it. NMEA 2000 can define a quasi-infinite number of new parameters by using these signatures (called PGNs). Thus, while the NMEA 0183 was limited to the management of a few electronic navigation equipment, NMEA 2000 can manage information from the motor (engine speed, consumption, oil pressure, temperature etc), levels (battery gauge, tank levels..), comfort (lighting, heating, air conditioning) and even entertainment (music). In fact it has no limits other than the progressive adaptation of each equipment of the vessel to this standard. Relatively expensive at its beginning more than 10 years ago, NMEA 2000 first developed in the large units market, but is now common on smaller boats. Today most electronic navigation instruments integrate it as standard. Other equipment (comfort, motorization, etc.) are beginning also to adopt the standard, particularly those intended for motor boats. So far nautical equipment manufacturers offered dedicated control panels for viewing NMEA2000 information and interact with the equipments and terminals. These panels are said to be dedicated, because they were designed for a specific use, and they are destined to remain on the boat. Unfortunately they are often inexpensive and not evolutive. The arrival of new devices allow today to do all this directly on the iPad. -It allows to display information from any NMEA 2000 equipment without having to use a dedicated terminal, either through an iPad app, or on any Web browser. -It can communicate with internet networks, making the information available also remotely! -Upon arrival to the boat, a simple glance on the iPad lets you know if the batteries are charged, water tanks are full, etc. -At sea, with the iPad near you in the cockpit, you can visualize data relevant to navigation (apparent wind, speed, etc), on the chart. -While motoring, you can check oil pressure, engine temperature, fuel consumption and make sure you can go to destination. -At anchor, you could even manage lighting and play music!